Wow, and his teeth look so natural! This guy could get a second job as a lighthouse. No need for dull, yellow, tobacco-stained teeth now. For a new safe treatmentâ€”Bleachodent Combinationâ€”bleaches away stains, and makes teeth flashing whiteâ€”often in just three minutes! Treatment consists of a marvelous liquid, which curdles and softens the stainsâ€”and a new kind of paste which gently removes the softened stains and presents the formation of new stains. Safe and harmless, as its mild ingredients are especially combined to act only on surface stains â€”not on the enamel itself. Only a safe mild preparation like Bleachodent Combination should be used on children’s teeth which are naturally soft and sensitive, and which are especially subject to stains and decay. Fine for the gums. Get Bleachodent Combination today for few cents. 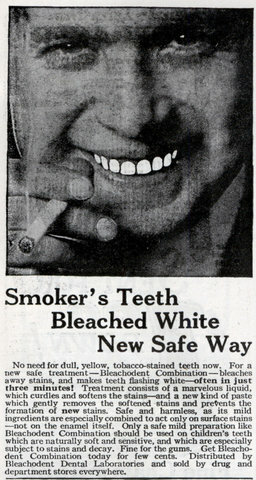 Distributed by Bleachodent Dental Laboratories and sold by drug and department stores everywhere.